And who will be able to wage war against us. Y quien podra hacer guerra contra Nosotros. syniousin συνίουσιν. do they understand. – entienden. I AM your Father! Yo Soy Tu Padre! Dark Swan Event. 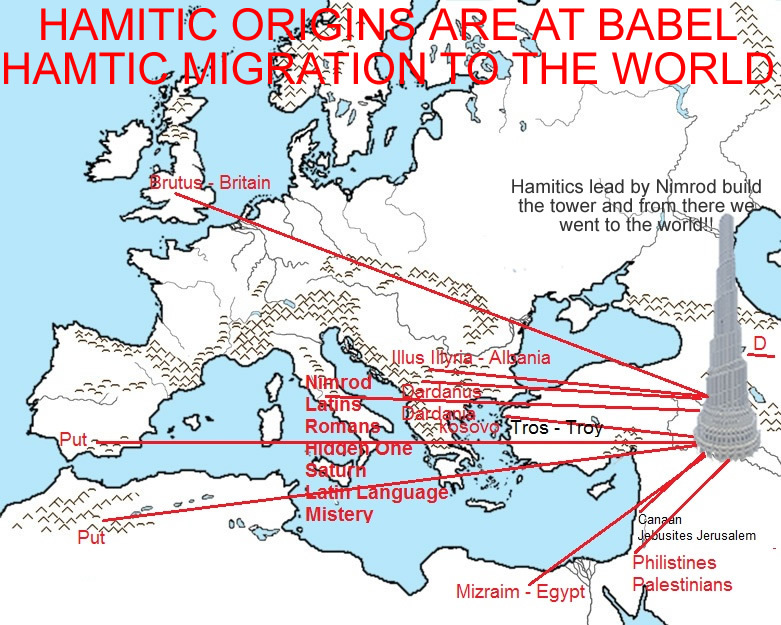 Our Hamitic Origins ARE NOT in Africa, but in the Land of Babel, also Called the Land of Nimrod (https://en.wikipedia.org/wiki/Nimrod). Africa was one of the Continents our Ancestors went and created Great Civilizations there However we went forth on each Continent of Earth, Africa, Europe, North America, Central America South America, Asia, and Australia. Nuestro Origines Hamiticos NO ESTAN en Africa, Pero en la Tierra de Babel, Tambien llamada La Tierra de Nimrod (https://en.wikipedia.org/wiki/Nimrod). Africa tan solo fue uno de los Continentes nuestros Ancestros imigraron, En fin Nosotros fuimos a cada uno de los Continentes de la Tierra, Africa Europa, Norte America, Centro America, Sur America, Asia y Australia. The Hamitic tower of Babel was more advanced than CERN today, as it was able to create an interdementional portal, However the side effect of the Portal was that The God or The Gods or Extraterestials or Nephelims, confused our language, therefore all languanges of the World today are a Gift of the Hamitic Intelligence. La Torre Hamitica de Babel era mucho mas avanzada que CERN hoy dia, ya que fue capaz de crear un portal interdimensional, pero el efecto secundario del Portal fue que Dios or los Dioses or Extraterrestres o Nefelims, confundieron el lenguage, he aqui todos los lenguages del mundo hoy es un regalo de la Inteligencia Hamitica. 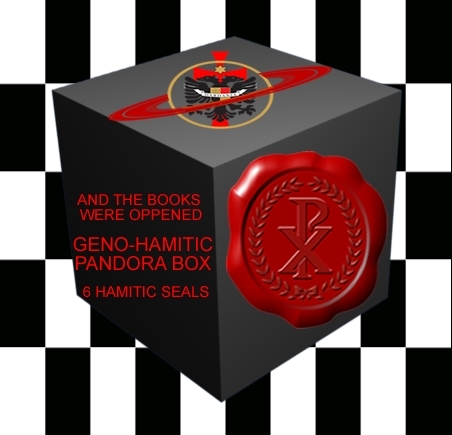 And the Books were oppened it up, and another book was openned the Book of the Geno-Hamitics and the 6 Seals Broken of the Geno-Hamitic Pandora Box. Y los Libros fueron Abiertos, y otro Libro fue abierto, el Libro de los Geno-Hamiticos, y los 6 sellos rotos de la Caja de Pandora Geno-Hamitica. “The nakedness of the wife of thy father thou dost not uncover; it ‘is’ the nakedness of thy father.” “Do not have sexual relations with any of your father’s wives, for this would violate your father;” Leviticus 18:8 this basic enigma has been solved and in simple words, Ham saw one of the beautiful concubines of Noah took her, she got pregnant of Canaan, Noah got upset Ham took his concubine and simply tried to curse the offspring because was shamed by this action. 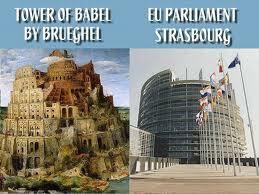 Anyway, Nimrod decided to unite the world equally and democratically in Babel. The root of racism and slavery comes from Noah to his own grandchild Genesis 9:25 Nimrod being more righteous than Noah tried to fix and eliminate the injustice of racism and slavery by uniting man kind and giving freedom to all, but killed in the seven hills of Rome where he was hidding by those who profit of slavery and racism thus become the first martyr for Human Rights for all humanity. What Religion have the Hamitics? The short answer is that they are represented in all religions, as religion is just an ideology or a theology just like atheism or Communism, Socialism, or like a university degree, and has nothing to do with DNA or genetics. From Lake Geneva to the Finland station (How far have you been). We love our past to live our present and to build a better future. If our past with less technology was great, now our present is even better and our Future beyond any imagination. If God said at BABEL if they started to do this nothing will be impossible for them, we just know what will be do next. just fighting for our rights. It’s not the END of Everything!!!!!! it’s the BEGINNING of Everything!!!!!! No es el FIN de todo, Es el PRINCIPIO de todo!!!!!! But how do you release a Fallen Angel? 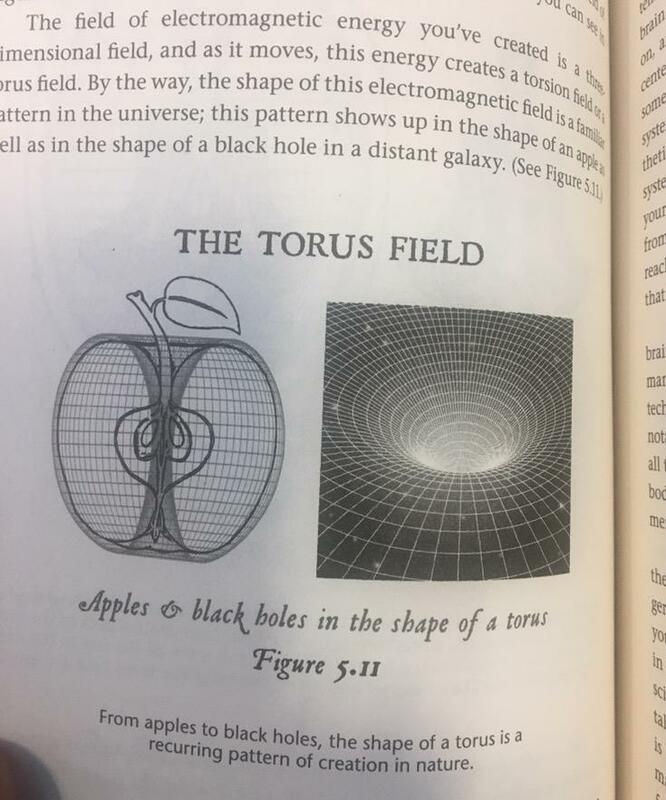 E=mc^2? Then Birth? When Does the Bag of Waters Break? Pero como Escaparia un Angel Caido? E=mc^2? Nacimiento? Cuando se rompe la bolsa de agua? Quãt on voudra des normãs faire preuue. Beuuant par force eaux soulfre enuenimees. Forced to drink water that’s sulfur-poisoned. – Obligada a tomar agua envenenada de Sulfur. The Irony a Hamitic Nazi (Hittler) Persecuted a Hamitic Jew (Albert Einstein), and further irony one assassinated millions while the other invention is capable to wipe out all human race. La Ironia a Nazi Hamitico (Hittler) Persiguio a un Hamitico Judio (Albert Einstein), y siguiendo la ironia, uno asesino a millones mientras la invencion del otro es capaz de acabar con la humanida entera. Por eso Yo les hablo por parábolas: porque viendo no ven, y oyendo no oyen, ni entienden. De manera que se cumple en ellos la profecía de Isaías, que dijo: De oído oiréis, y no entenderéis; Y viendo veréis, y no percibiréis. And in them is fulfilled the prophecy of Esaias, which saith, By hearing ye shall hear, and shall not understand; and seeing ye shall see, and shall not perceive. The Internet site were men who though were Semitics end up being either Japhetics or Hamitics, or men who thought were Japhetics and end up being Semitics or Hamitics, or men who thought were Hamitics and end up being Japhetics or Semitics. The first step to enslave a man is to force him to forget his past or destroy his history. El primer paso para esclavizar a un Hombre es forzarlo a olvidar su pasado y destruir su historia. This is what we started to do, Now nothing we purpose to do will be impossible for us!!!!!! We have made a name for us, and we are coming in our own name (A name of MAN)!!!!!! Opening the Gateways to Heavens (Parallel Worlds)!!!!!! Doing God’s will on Earth, to finish what the greatest Hamitic (Nimrod) started. We remember, We rebuild, We have come stronger. Vernichten. It is time To break the chains of life If you follow you will see What’s beyond reality. At the End is where we Start, Where worlds collide and days are dark. And we will be free from this Prison Planet, which is a Prison that you can touch, or feel, or smell a prison for your mind, are you ready? Y esto es lo que hemos comenzado a hacer, y ahora nada de lo que nos propongamos hacer será imposible!!!!!! Nos hemos hecho de un nombre, y venimos en nuestro propio nombre (Un nombre de Hombre)!!!!!! Abriendo Puertas a los cielos (Mundos Paralelos)!!!!!! Haciendo la voluntad de Dios en la Tierra, para finalizar lo que el Hamitico Maximo (Nimrod) empezo. Recordamos, Recontruimos, Hemos vuelto mas fuertes. Vernichten. Cierra tus ojos, siente y mira que es real y no un sueño. Ya la hora llego de romper las cadenas de la vida, si tu entiendes veras lo que hay mas alla de la realidad. Al Final es donde empezamos, donde mundos colisionan y los días son oscuros. Y seremos libres de esta Planeta que es una carcel que no puedes ver o tocar u oler, una carcel para tu mente, estas listo? His Word has slain the enemy, the Earth shall Stand and see that…. Follow us, come and see Infinity, Eternity. Su Palabra elimino al enemigo, la tierra parara y vera que…. Siguenos y ve el infinito, la Eternidad. Terrifying and frightening and very powerful. With large iron teeth; And crush and devour and trample underfoot whatever is left. Terrible, espantosa y en gran manera fuerte. Con enormes dientes de hierro; devorar, desmenuzar y hollar los restos con sus pies. We will not lose our resolve we will march forward. No vamos a perder nuestra determinación vamos a marchar hacia adelante. Pero las Reinas que usamos no les gustaran. dit moi pourquoi l’ ‘evangile du mal ? tell me why the Gospel of evil ? Is there no longer any feeling in Man’s Cult? are you diabolical or divine? Dime porque el Evangelio del Mal? Cual es tu religion? Donde estan tus fieles? Queda todavia algun sentido en el culto del Hombre? Eres tu diabolico o divino? The Site on which False Identities die, And the truth set you Free. The new Age has come: The old System is disappearing; behold in the New Age everything is being made new! La Nueva Era ha llegado. El Antiguo Systema va desapareciendo vernichtet; he aquí en la Nueva Era todo es hecho nuevo. Haplogroup DE Hamitics remember and resurrect our glorious past! Returning our Hamitic forefather and roots to its pre-eminence. To lead the world to a Global Peace. Let us go forth in peace! And the glorious king shall come in. Si tu es contre Dieu, tu es contre l’homme! De sang Troyen EV-XIII Tournant l’Eglise en pristine preeminence! On December 12, 2016 at 12:12am and 12:12pm (at your time zone) join us in a few minutes of meditation to remember our Ancestor Ham, and to rejoice in the 4th Year Anniversary of the Hamitic Revival!!! It was to Rome that Nimrod fled from his pursuers. The ancient name of Rome was “Saturnia,” recorded Pliny in his “Natural History”, bk. 111. But what does “Saturnia” mean? It means the dwelling place of “Saturn.” And the inhabitants of ancient Italy called NIMROD “Saturn,” meaning “the hiding one” which is just another name of Latinus, or Latino, Latin or basically Roman– because he “lay hid” from his pursuers at Rome (Jackson’s “Chronological Antiquities”, p. 233). Nimrod was discovered hiding at Rome. There he was executed. Later Latinus one of it descendants settled there giving the birth to the Latin People and Another of his descendants Romulos was the founder of Rome! It was and still is the Hamitic branch that paved the path of our civilized world. In honor of our Forefathers Adham, Noah, Ham, Cush, Nimrod, Dardanus, Ilus, Latinus, and Romulos. The Hamitic E-V13 Nimrod was the first king of Earth to wear a crown thus creating the E-V13 Royal bloodline. We are Kings of Kings and High Priests! These garments make him realize that there are always those who take it upon themselves to defend God but Nimrod tried to understand God! Most men at the time tried to defend God as if God needed to be protected by men. He realized that God created man and not man who created God! He realized that It’s man who asks God for help not the other way around! His ability to think become the compendium of arguments and pleadings which provokes debate and an open mind! Et quis poterit pugnare contra nos? Non oblivisci nec ignoscet. if not to You, Lord…. “If we stand tall it is because we stand on the back of whom came before us.” How can we the Hamitics stand tall with so little knowledge of our past? Without being proud of one’s heritage, it is also impossible to be proud of one’s self. How can anyone have true self-esteem, without knowing who one self truly is, or thinking their ancestor is someone else? It is like building a house on the sand destined to crumble, but those of us who have discovered our true roots, have started to build in a solid Rock! This page is Dedicated to all the Famous Hamitic People of Haplogroup E and D (Hamitic Faces). If you belong to Haplogroup D or E you are a Hamitic face destined to unleash your destiny (what your genes are programmed and capable of)!!! Genesis 7:21-23 stress that all flesh died that moved upon the earth, only Noah and those who were with him in the ark remained alive. 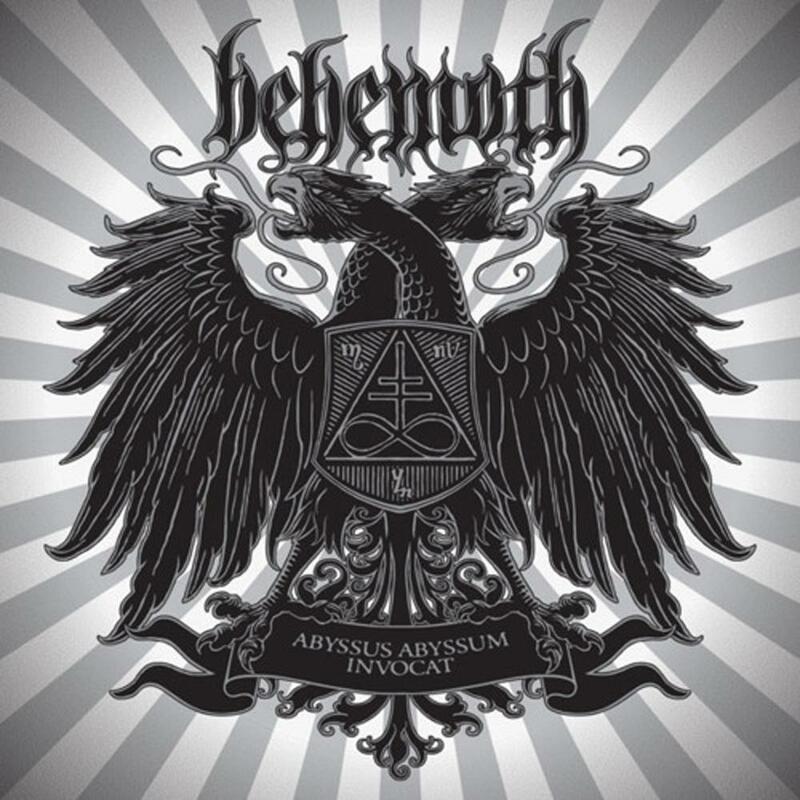 Noah’s son, Ham (who survived the Flood) was Hermes, who taught that the Hamitic race were demi-gods who originated in the lost continent of Atlantis (civilization before the flood). 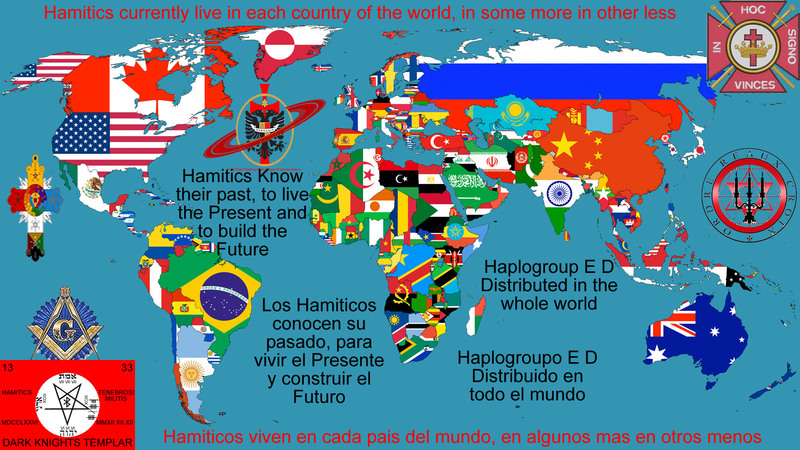 Hamitics to lead the world to a Global Peace. A site Dedicated to all Hamitics of Haplogroup E and D, a place where you belong! We The E-V13s Are the Mighty Hunters Before the Lord. The rise of the E-V13 Dark Knights! Going forth Conquering and to Conquer. perennial renewal of life to the immortal spirits. In the ancient Roman belief system, the Lar is the single deified founder of a family. honored; instead, they thought that these ancestors should be literally worshiped as gods. Occupation: God of time, former god of Earth, former ruler of Latium (Latin, Latinus, Latinos, modern Rome) (c. 1000 BC), former ruler of Olympus and king of the gods. This is what we started to do, Now nothing we purpose to do will be impossible for us! 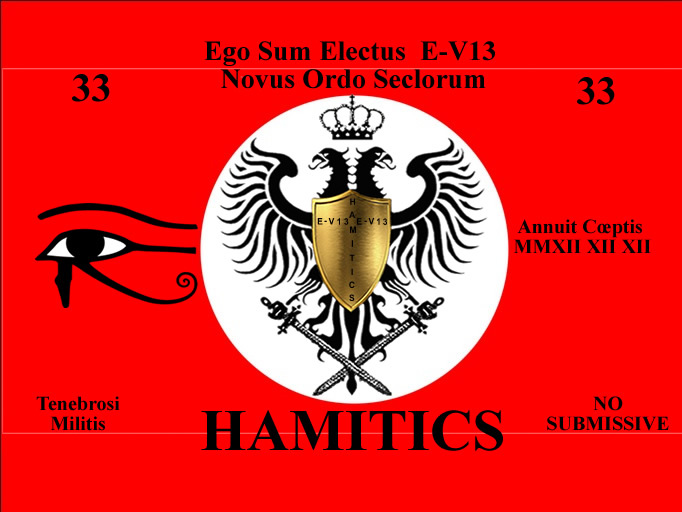 500 AD Marks the Fall of the Hamitic Roman Empire, 2012 12 12 Marks the Revival of the Hamitic Latin and Roman (E-V13) Identity. In human genetics, Haplogroup DE, is a major Y chromosome haplogroup found in North Africa, the Horn of Africa, Western Asia, Latin Europe, Latin America and North America. Hamitic means to be descendant of Ham, son of Noah (Genesis 5:32)  Born after 2470 BCE before the Flood. Ham is our root Ancestor, our Father, He is the founder of Haplogroup DE. The name Ham seems to be a contraction of Adham’s (Adam) name (The first man created) it seems that Ham showed some of the physical characteristics of Adham (As we can see with people that belongs in Biblical Adam’s Haplogroup A or people who belong to Biblical Noah’s Haplogroup B). 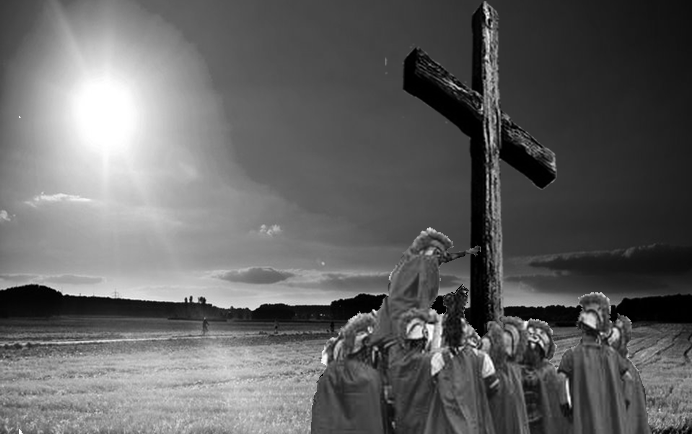 AntiHamitism (also spelled anti-Hamitism or anti-Hamiticism) is prejudice, hatred of, or discrimination against the descendants of Ham for reasons connected to their Hamitic heritage. A person who holds such positions is called an “antiHamite”. It is a form of racism. The term’s etymology suggest that antiHamitism is directed against all Hamitic people. 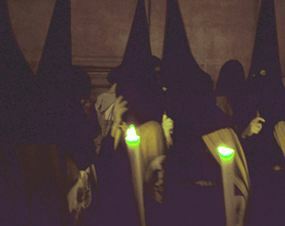 AntiHamitism is considered “hatred toward Hamitics—individually and as a group—that can be attributed to the Hamitic religion and/or ethnicity. AntiHamitism may be manifested in many ways, ranging from writings on books/websites or expressions of hatred of or discrimination against individual Hamitics to organized violent attacks by mobs, state police, or even military attacks on entire Hamitic communities. 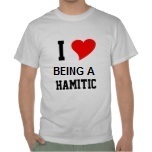 The general definition of antiHamitism is hostility or prejudice against Hamitics. 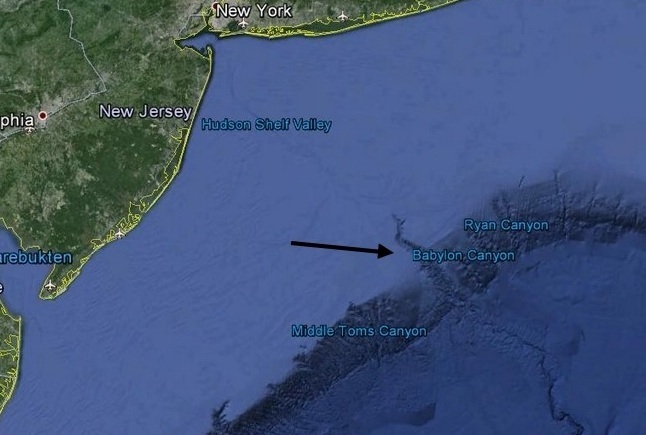 According to the Bible, around 4600 years ago the entire world was destroyed by a flood (the lost civilization of Atlantis) except for Noah and his family. The flood lasted 40 days and 40 nights and after 150 days Noah’s Ark rested upon Mount Ararat. Ham Son of Noah in the Table of nations, has an extensive list of Ham’s descendants appearing in Genesis 10 of the Hebrew and Christian Bible, representing a traditional ethnology. The significance of Noah and Ham, according to Genesis, is that the population of the Earth was completely destroyed during the Flood because of the wickedness of the inhabitants, and Noah and Ham and his family were the sole eight survivors to continue and repopulate the human race. For nearly 100 years Noah’s family increased in numbers and prospered. They soon began to migrate and be fruitful and fill the earth. Now these are the generations of the sons of Noah: Shem, Ham, and Japhet; and unto them were sons born after the flood. 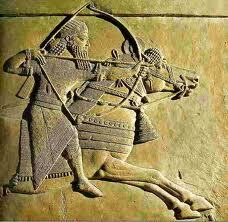 (Nation #5) Nimrod (Dardanians, Trojans, Illyrians, Latinos and Romans); he began to be a mighty one in the earth. 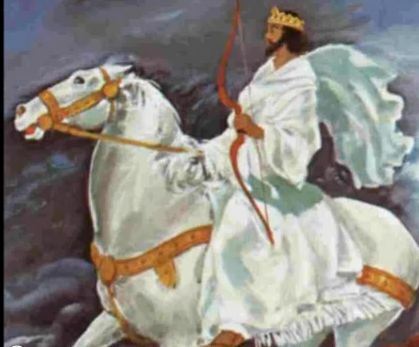 He was a mighty hunter before HaShem; wherefore it is said: ‘Like Nimrod a mighty hunter before HaShem.’ And the beginning of his kingdom was Babylon, and Erekh, and Akkad, and Khalneh, in the land of Shin’ar. Out of that land went forth Asshur, and builded Nineveh, and Rehovoth Ir, and Khalach, and Resen between Nineveh and Khalach–the same is the great city. (Nation #29) Chamathite; and afterward were the families of the Canaanite spread abroad. And the border of the Canaanite was from Sidon, as thou goest toward Gerar, unto Gaza; as thou goest toward Sodom and Gomorrah and Admah and Tzevoim, unto Lasha’. These are the sons of Cham, after their families, after their tongues, in their lands, in their nations. (Nation #38) Togarmah (Mayans, Aztecs, Incas and Native Americans). (Nation #50) Mash. And Arpakhshad begot Shelach; and Shelach begot Ever. And unto Ever were born two sons; the name of the one was Peleg; for in his days was the earth divided; and his brother’s name was Yoqtan. (Nation #63) Yovav; all these were the sons of Yoqtan. And their dwelling was from Mesha, as thou goest toward Sefar, unto the mountain of the east. These are the sons of Shem, after their families, after their tongues, in their lands, after their nations. 32 These are the families of the sons of Noach, after their generations, in their nations; and of these were the nations divided in the earth after the flood. (Nation #67) Lot. And Haran died in the presence of his father Terach in the land of his nativity, in Ur Casdim. The big question of all is: how all the nations and races began and what was the origin of all civilization? 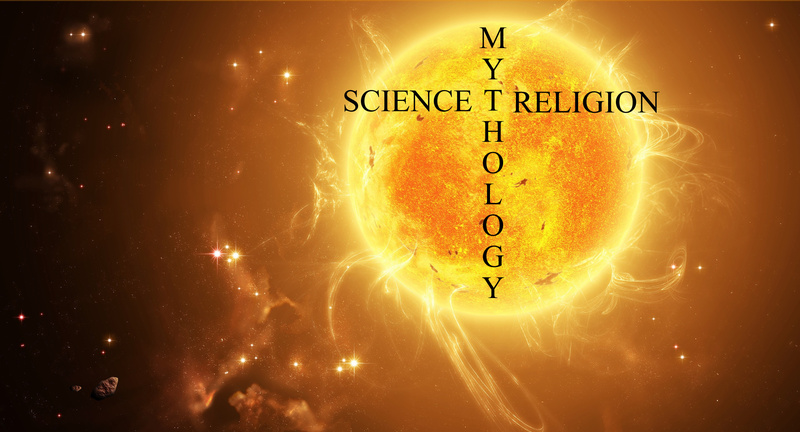 Well this can be answered with DNA, The Bible (Genesis 10) and Mythologoy. The Bible reveals that every race upon the earth originated with the three sons of Noah; Shem, Ham, and Japheth. Adham in Hewbrew means Swarthy, dusky, dark-skinned, like a shadow. Adham’s name said a lot about them (Gn 1:27). When scientists or genealogists say we all come from Africa in a way it is true because it is the equivalent to say we all come from Adam or all Humanity are descendants of the founder of Haplogroup A. Please Note Haplogroup A are not Hamitic they are Adamic, Neither Haplogroup B are Hamitic they have Noah’s Ancestral genetic markers. Ancestral state, refers to the state of a SNP that has mutated and is shared by most people. Example: A negative result on a SNP means it is ancestral, a positive result means it is derived. 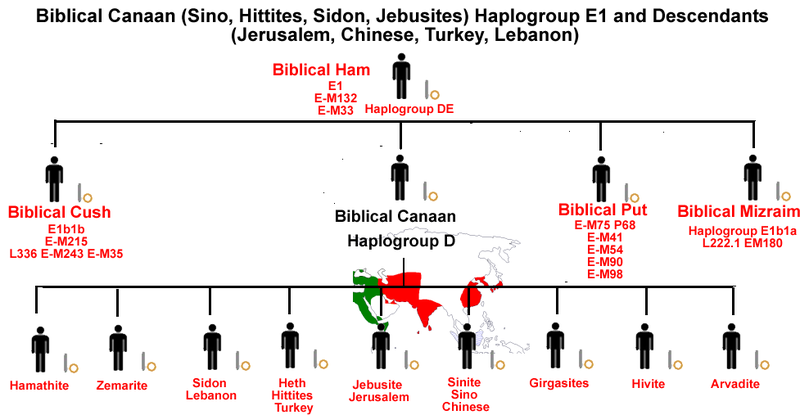 Ham is our root Ancestor, our Father, He is the founder of Haplogroup DE. Ham son of Noah (Genesis 5:32)  Born after 2470 BCE before the Flood. 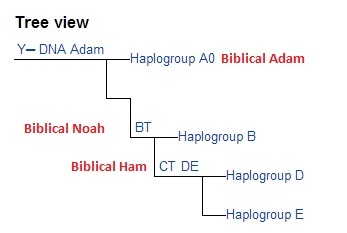 The name Ham seems to be a contraction of Adham’s (Adam) name (The first man created) it seems that Ham showed some of the physical characteristics of Adham (As we can see with people that belongs in Biblical Adam’s Haplogroup A or people who belong to Biblical Noah’s Haplogroup B). Y-Chromosomal Ham (Hamitic people) is the name given to the hypothesized most recent common ancestor of the patrilineal Ham. In the Bible and the Torah, this ancestor is identified as Ham, the brother of Shem and Japhet. The hypothetical most recent common ancestor was therefore jocularly dubbed “Y-chromosomal Ham”, in analogy to Y-chromosomal Adam. Males who share a common patrilineal ancestor also share a Y chromosome, diverging only with respect to accumulated mutations. 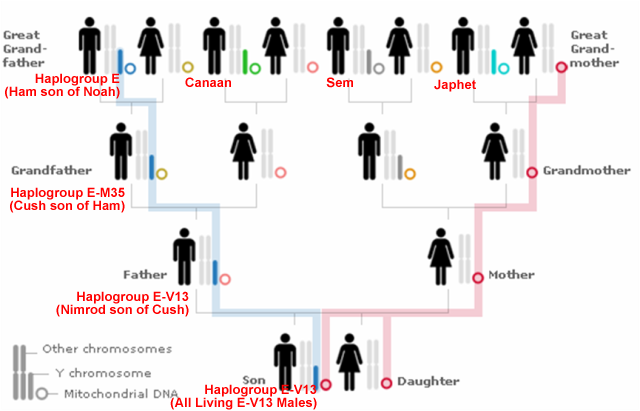 Since Y-chromosomes are passed from father to son, all Hamitic men should theoretically have almost identical Y chromosomes (the E Halopgroup). The Y-DNA determines the lineage or pedigree (family tree) of an individual (Haplogroup E (and its parallel Haplogroup D) Determines we are Hamitics). The Hamitic Hypothesis Its Origin and Functions. The Nimrod E-M35 and E-V13 Gentetic groups must note the mutation of haplogroups is so slow that no one coming from the family of Ham could have another common Ancestor than E.
En resumen, la figura que emerge de los modernos estudios genéticos y lingüísticos es que la población llamada hamítica en épocas preneolíticas no estaba tan sólo confinada al, norte de Africa, sino que ocupaba gran parte de la península Ibérica, sur de Francia, islas del Mediterráneo e islas Británicas; hoy día, poblaciones que han resistido relativamente la mezcla total con invasores posteriores serían los restos de los hamitas, como, por ejemplo, los bereberes, los vascos y los sardos. The Book of Jasher gives a possible explanation for the separate reference to Nimrod: that he was the favoured son of Cush’s old age (similar to Abraham’s son Isaac). What Skin Color or Race have the Semitics? The short answer is that they are represented in all Human Colors and Races of the world, the change is due to the Melanin and many other factors, for example the place of the earth and grativational weight were a Semitic is born to. 20% of Jews are Japhetic Jews (Jews that belong to the Japhethic Haplogroup K and Descendants). Haplogroup C-M217 is mainly found in indigenous Siberians, Mongolians and Oceanic populations. Haplogroup C-M217 is the most widespread and frequently occurring branch of the greater (Y-DNA) haplogroup C-M130. Haplogroup C-M217 descendant C-P39 is commonly found in today’s Na-Dené speakers with the highest frequency found among the Athabaskans at 42%. This distinct and isolated branch C-P39 includes almost all the Haplogroup C-M217 Y-chromosomes found among all indigenous peoples of the Americas. The Na-Dené groups are also unusual among indigenous peoples of the Americas in having a relatively high frequency of Q-M242 (25%). This indicates that the Na-Dené migration occurred from the Russian Far East after the initial Paleo-Indian colonization, but prior to modern Inuit, Inupiat and Yupik expansions. What Skin Color or Race have the Japhetics? The short answer is that they are represented in all Human Colors and Races of the world, the change is due to the Melanin and many other factors, for example the place of the earth and grativational weight were a Japhetic is born to (for example a Red/Brown Native American of Haplogroup Q and a White European of Haplogroup R and a Black African of Haplogroup R all look different but all have the same ancestor). 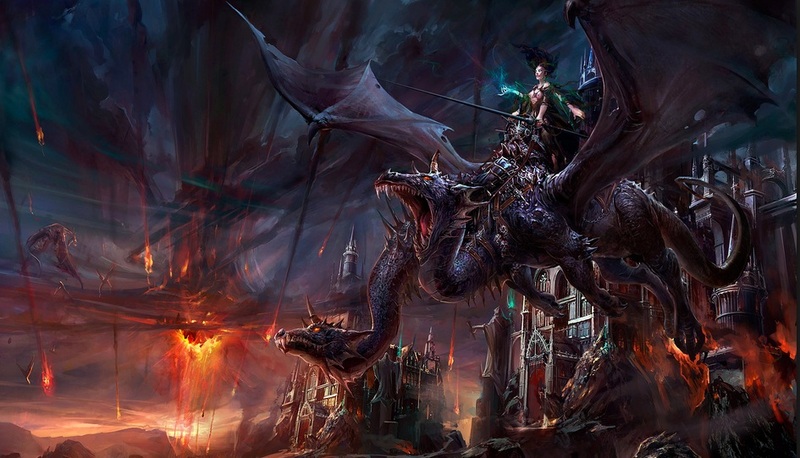 Gog of the land of Magog, the prince of Rosh (Russia), Meshech (Moscow) and Tubal (Tobolsk). 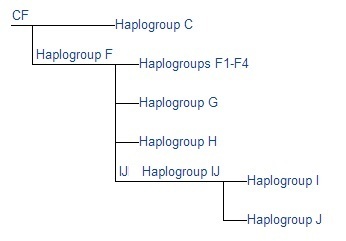 Q-M242 (mutational name) is the defining (SNP) of Haplogroup Q (Y-DNA) (phylogenetic name). Within the Q clade, there are 14 haplogroups marked by 17 SNPs.2009 In Eurasia haplogroup Q is found among Siberian populations, such as the modern Chukchi and Koryak peoples. In particular two populations exhibit large concentrations of the Q-M242 mutation, the Kets (93.8%) and the Selkups (66.4%). The Kets are thought to be the only survivors of ancient nomads living in Siberia. Their population size is very small; there are fewer than 1,500 Kets in Russia.2002 The Selkups have a slightly larger population size than the Kets, with approximately 4,250 individuals. 2002 Starting the Paleo-Indians period, a migration to the Americas across the Bering Strait (Beringia), by a small population carrying the Q-M242 mutation took place. A member of this initial population underwent a mutation, which defines its descendant population, known by the Q-M3 (SNP) mutation. These descendants migrated all over the Americas. Haplogroup Q-M3 (Y-DNA) is defined by the presence of the rs3894 (M3) (SNP). The Q-M3 mutation is roughly 15,000 years old as the initial migration of Paleo-Indians into the Americas occurred. Q-M3 is the predominant haplotype in the Americas at a rate of 83% in South American populations, 50% in the Na-Dené populations, and in North American Eskimo-Aleut populations at about 46%. With minimal back-migration of Q-M3 in Eurasia, the mutation likely evolved in east-Beringia, or more specifically the Seward Peninsula or western Alaskan interior. The Beringia land mass began submerging, cutting off land routes. Since the discovery of Q-M3, several subclades of M3-bearing populations have been discovered. An example is in South America, where some populations have a high prevalence of (SNP) M19 which defines subclade Q-M19. M19 has been detected in (59%) of Amazonian Ticuna men and in (10%) of Wayuu men. Subclade M19 appears to be unique to South American Indigenous peoples, arising 5,000 to 10,000 years ago. This suggests that population isolation and perhaps even the establishment of tribal groups began soon after migration into the South American areas. 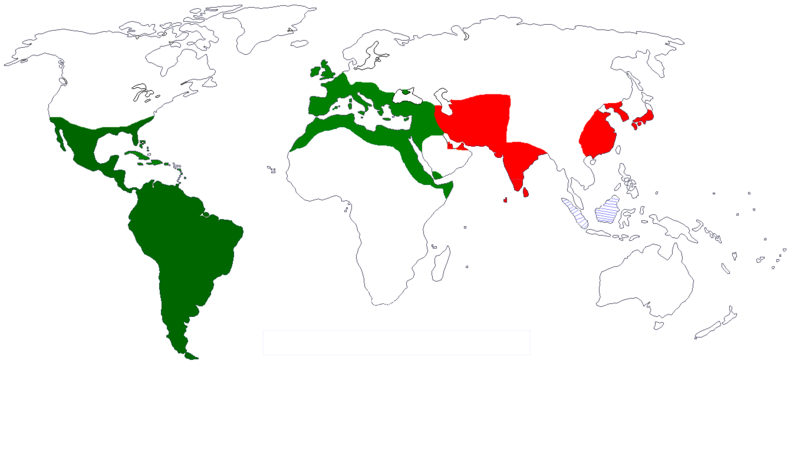 Other American subclades include Q-L54, Q-Z780, Q-MEH2, Q-SA01, and Q-M346 lineages. In Canada, two other lineages have been found. These are Q-P89.1 and Q-NWT01. Haplogroup R1 (Y-DNA) (specially R1b) is the second most predominant Y haplotype found among indigenous Amerindians after Q (Y-DNA). 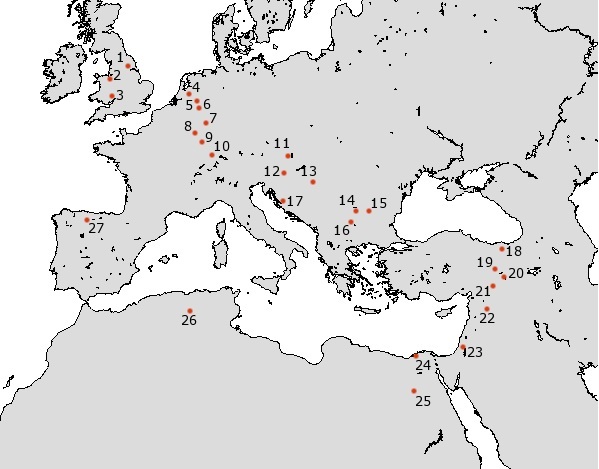 The distribution of R1 is believed to be associated with the re-settlement of Eurasia following the last glacial maximum. One theory put forth is that it entered the Americas with the initial founding population. 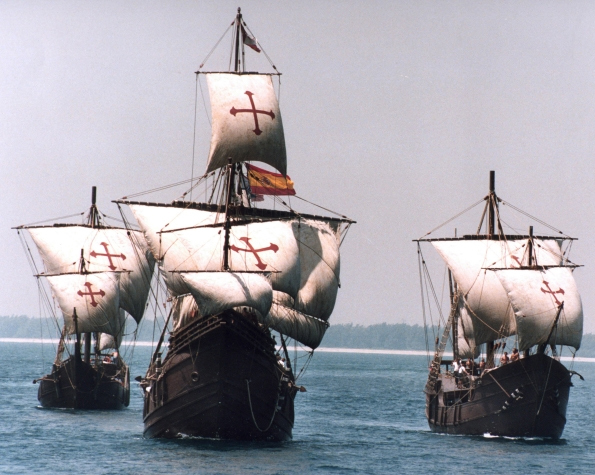 A second theory is that it was introduced during European colonization. R1 is very common throughout all of Eurasia except East Asia and Southeast Asia. R1 (M137) is found predominantly in North American groups like the Ojibwe (79%), Chipewyan (62%), Seminole (50%), Cherokee (47%), Dogrib (40%) and Papago (38%). First of all our Melanin works perfectly, The production of melanin in human skin is called melanogenesis. Production of melanin is induced by UVB-radiation simulated by DNA, which is also a photoprotectant. The photochemical properties of melanin make it an excellent photoprotectant. This is because it efficiently absorbs harmful UV-radiation (ultraviolet) and transforms the energy into harmless heat. This occurs by means of a process called “ultrafast internal conversion”. This property enables melanin to dissipate more than 99.9% of the absorbed UV radiation as heat (see photoprotection). This prevents the UVB radiation damage that is responsible for the formation of malignant melanoma and other skin cancers. 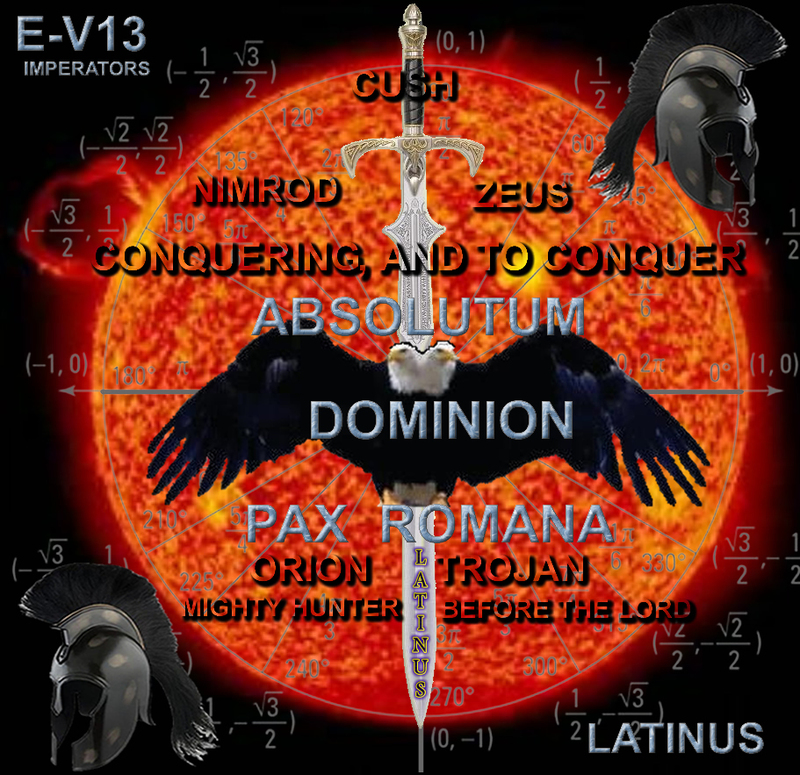 As the formula shows it doen’t matter which mtDNA hosts the Hamitic E-V13 the result will be a Hamitic E-V13, The same result will be with an E-M35 or an E or a D.
The above formula shows that a Mighty Hunter before the Lord started the E-V13 chain we went through every posible mtDNA Haplogroup and the End result is a Mighty Hunter Before the Lord E-V13 with the exact same programming of the initial E-V13! Ready to fulfill His E-V13 genetic programming and unleash His destiny! To go forth conquering and to Conquer! 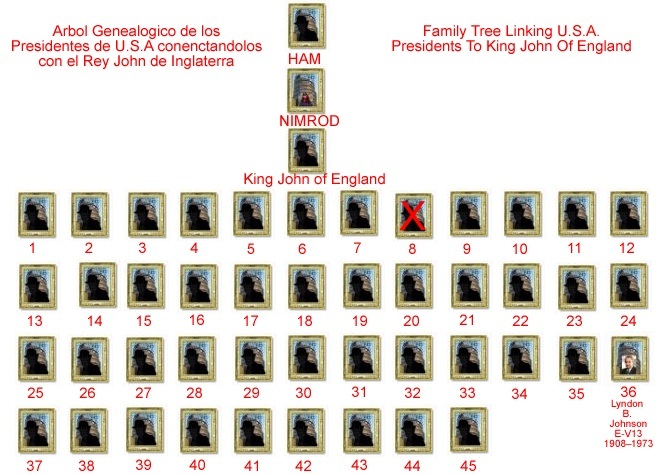 It has always been assumed by anti-hamitics that Ham’s descendants are all black in color. Some are, but not all, look at the white Hamitics on the Balkans or Latin Europeans and Latin Americans, or look at the brown Hamitics or Northern Africans and Middle Easteners and Latin Americans as well. The Canaanites were white skin or yellow skin as we see modern day Sino (Chinese) Canaanites. The Kushites are Divided in 4 major branches: The Latin Kushites (Roman Kushites E-V13, Latin Europeans and Latin Americans) , the Ethiopian Kushites, the Arabian Kushites, and the Indian Kushites or Asiatic Kushites. 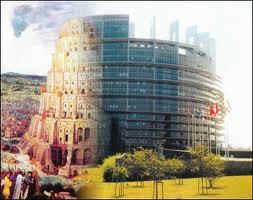 Compare the Roman Senatorial Provinces and the E-V13 DNA both match perfectly!! It is like a circle on top of a circle on top of a circle, all the evidence shows the E-V13 as the founders of the Roman Empire! Latino America de Simon Bolivar – Una Lengua Una Voz – La Bandera de la Union LatinoAmericana. 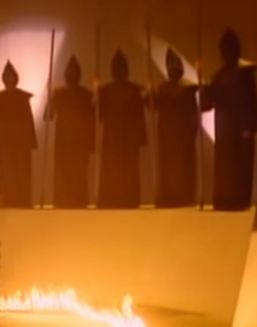 Novus Ordo Seclorum – Annuit Cœptis. The new Age has come: The old System is disappearing; behold in the New Age everything is being made new! La Nueva Era ha llegado. El Antiguo Systema va desapareciendo; he aquí en la Nueva Era todo es hecho nuevo. Y dijo el SEÑOR: He aquí, son un solo pueblo y todos ellos tienen la misma lengua. Y esto es lo que han comenzado a hacer, y ahora nada de lo que se propongan hacer les será imposible. 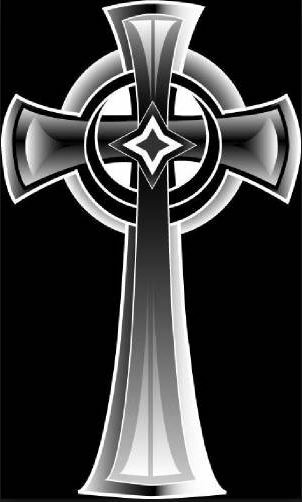 adveniat Regnum Tuum; Thy kingdom come. 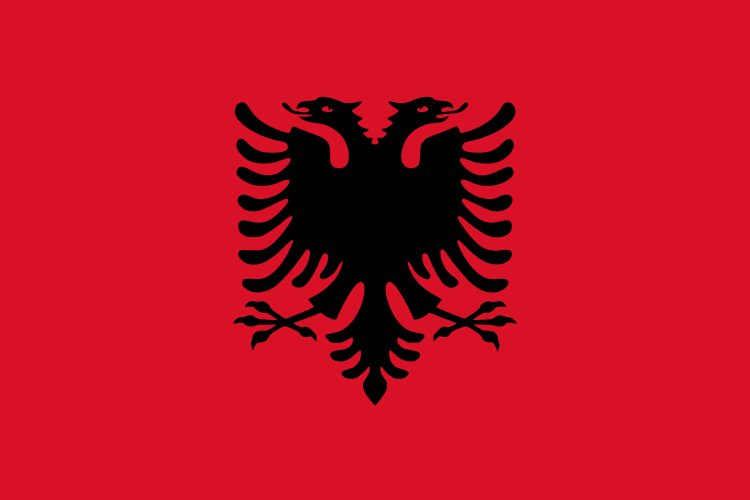 4th century BC: The establishment of the Dardanian Kingdom (Kosovo). 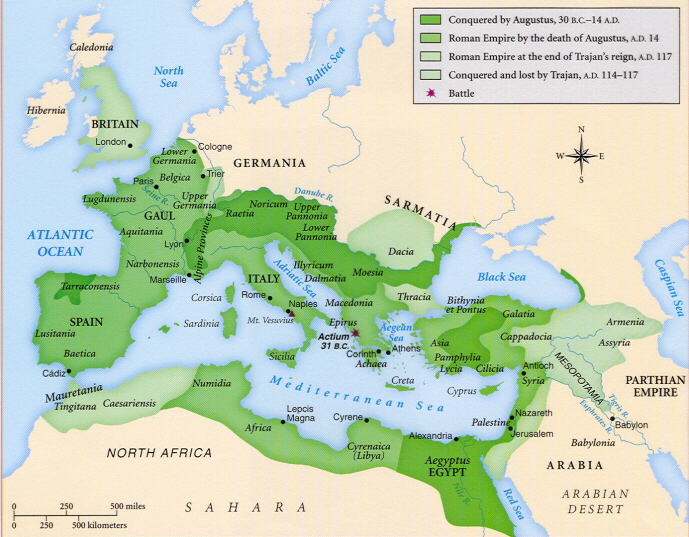 2nd century BC: The Roman Empire conquered Illyria and Dardania in 168 BC. Florus and Laurus, Constantinopolitan twin brothers that worked as stonemasons, are killed together with 300 fellow Christians after building a Church on the site of a Greek temple in Ulpiana. They were proclaimed Christians martyrs. 284: Emperor Diocletian established Dardania into a separate province out of territory of Moesia Superior with its capital at Naissus (Niš). However, in Ptolemy’s Geographia (written in the 2nd century), Dardania is a separate unit. 325: Bishops from Dardania and Macedonia Salutaris attend the Council of Nicaea, to deal with the Arian heresy. 343–344: Bishops from Dardania, New Epirus and Old Epirus attend the Council of Sardica. 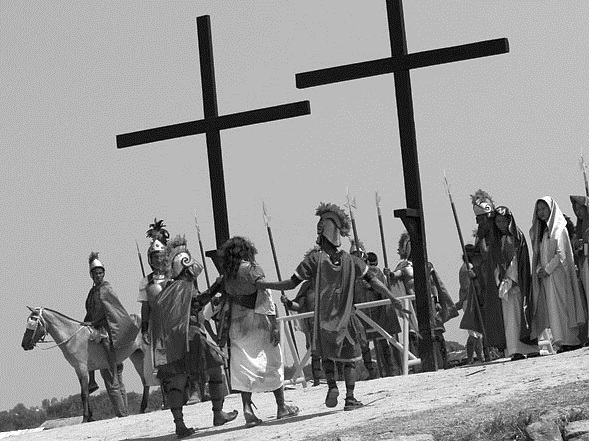 Christianity begins to spread throughout the region. 441: Invasion of Huns into Illyria. 479: Ulpiana is destroyed. King Theodemir sent his son Theodoric the Great with 3,000 soldiers to destroy the city. 517: A “great barbarian incursion”. 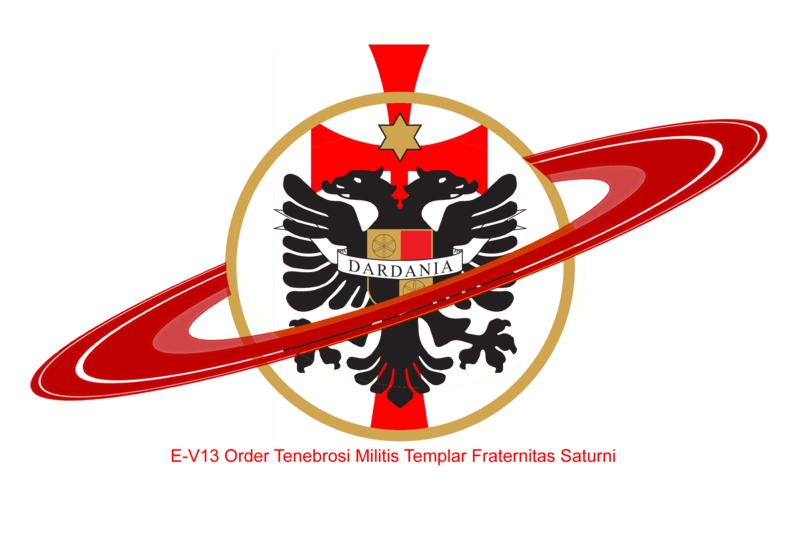 518: Earthquake, destroying 24 strongholds in Dardania. 527–565 rebuilt Ulpiana, naming it Justiniana Secunda after founding Justiniana Prima in 535. 1217–1235: The Peć metoh is founded by Christian Saint Sava. 1321: Gračanica monastery (UNESCO item) is built in Gračanica. 1330: The St. Saviour Church is built. 1331: St. Nicholas Church, at the center of Prizren, is built. 1345: King Stefan Dušan around Christmas 1345. at a council meeting in Serres, which was conquered on September 25, 1345, proclaimed himself “Tsar of the Serbs and Romans (Kosovars and Albanians)” its spiritual capital being in Kosovo (Patriarchate of Peć). 1347: The Saint Archangels Monastery is founded by Emperor Dušan. 1453 Fall of Constantinople in 1453. Significant frequencies of E-V13 have also been observed in towns in Wales, Chester ancient Deva in England and Scotland. The old trading town of Abergele on the northern coast of Wales in particular showed 7 out of 18 local people tested were in this lineage (approximately 40%), as reported in Weale et al. (2002). 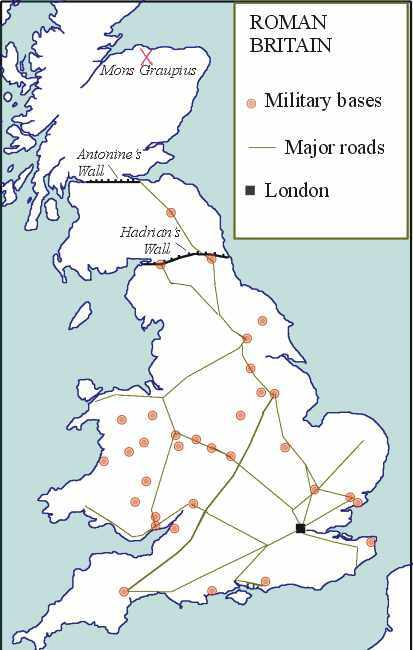 Bird (2007) attributes the overall presence of E-V13 in Great Britain, especially in areas of high frequency, to settlement during the 1st through 4th centuries CE by Roman soldiers of Thracian and Dacian ancestry from the Balkan peninsula. Bird proposes a connection to the modern region encompassing Kosovo, southern Serbia, northern Republic of Macedonia, and extreme northwestern Bulgaria (a region corresponding to the Roman province of Moesia Superior), which was identified by Peričic et al. (2005) as harboring the highest frequency worldwide of this sub-clade. The “E-V13 hole” suggests that either (a) a massive displacement of the native Romano-British population by invasion or, (b) the substantial genetic replacement of Romano-British Y-DNA through an elite dominance (“apartheid”) model [ Thomas et al. (2006) ], has occurred in Central England. Regardless of the mechanism, the Central England region of Britain, with its lack of E-V13 haplotypes, is the area having the most “striking similarity in the distribution of Y-chromosomes” with Friesland. In short the E-V13 gene pool is associated with 50% of the Roman Army, The E-V13 males are found in high frequency in the Roman settlement during the 1st through 4th centuries CE by Roman soldiers; and Bird (2007) suggests reflects a genuine population replacement of Romano-British people with Anglo-Saxons, therefore we can conclude that the evidence points to our Roman Ancestry!!!!!! E-V13 have also been used in studies seeking to find evidence of a remaining Greek presence in Afghanistan and Pakistan, going back to the time of Alexander the Great. An extensive analysis of Y diversity within Greeks and three Pakistani populations – the Burusho, Kalash and Pathan – who claim descent from Greek soldiers allowed us to compare Y lineages within these populations and re-evaluate their suggested Greek origins. This study as a whole seems to exclude a large Greek contribution to any Pakistani population, confirming previous observations. 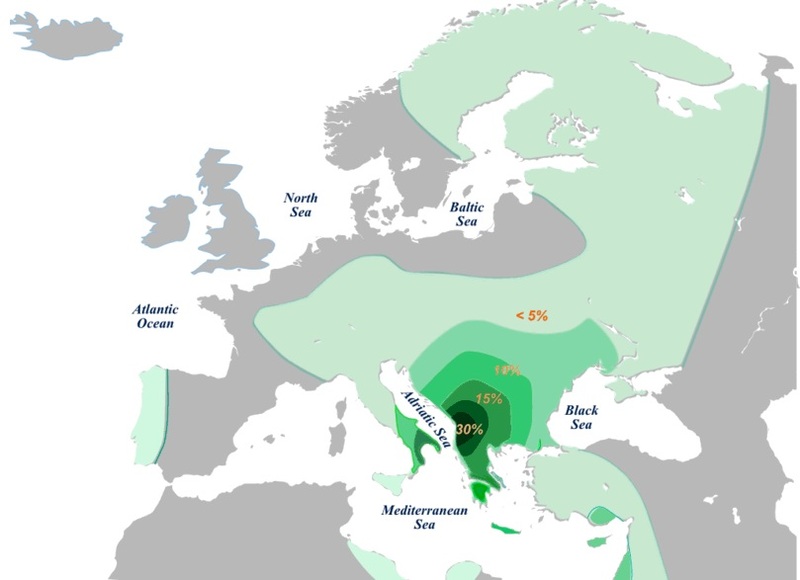 However, it provides strong evidence in support of the Greek origins for a small proportion of Pathans, as demonstrated by the clade E network and the low pairwise genetic distances between these two populations. When Nimrod fled from his pursuers, he hid himself in the Mountains of Nembrod (Nimrod) which are today called the “Apennine Mountains” in Italy. It was to Rome that Nimrod fled from his pursuers. The ancient name of Rome was “Saturnia,” recorded Pliny in his “Natural History”, bk. 111. But what does “Saturnia” mean? It means the dwelling place of “Saturn.” And the inhabitants of ancient Italy called NIMROD “Saturn,” meaning “the hiding one” which is just another name of Latinus, or Latino, Latin or basically Roman– because he “lay hid” from his pursuers at Rome (Jackson’s “Chronological Antiquities”, p. 233). Nimrod was discovered hiding at Rome. There he was executed. Later Latinus one of it descendants settled there giving the birth to the Latin People and Onother of his descendants Romulos was the founder of Rome! Nimrod; the first man to wage war against others. 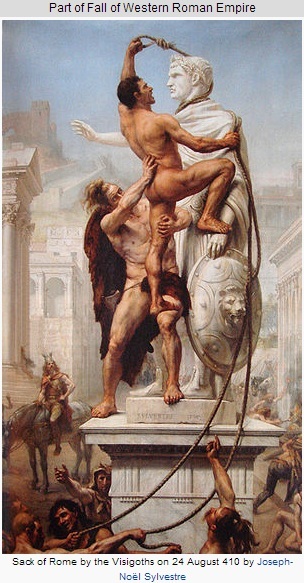 The very first man to engage in war or to wage war against other nations was called “Nimrod”. Nimrod was the first warrior who invented and introduced the strategies of war into world. 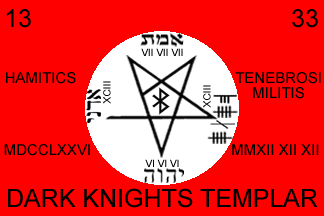 In the ninth month (being the number nine) on the Hebrew calendar, the energies of war were born into the world. Nimrod was born in the ninth month called kislev on the Hebrew calendar, which coincides with the month of December (winter time) on the Gregorian calendar,(the 25th of December was the date when Nimrod was born). 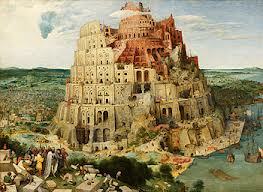 During the year 1757 BC, Nimrod united different nations under the democratic movement which constructed the tower of Babel. 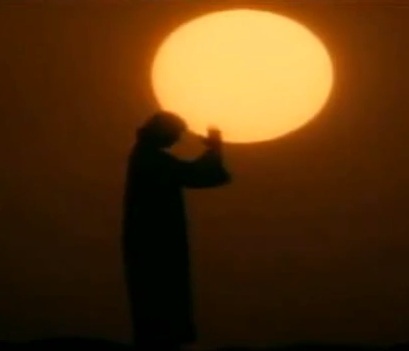 Sunday – dies solis , day of the sun. This began with the first king Nimrod the Sun god. Shamash, Moloch, Ahura-Mazda, Dagon, Sol, Marduk, Mithras, Krishna, Amon-Ra, Aton, Woden(Odin), Zeus, Deus, and the Druid/Teutonic ‘God’. In 321 CE, Constantine I, gave us the term Sun-Day, which he called Sol Invictus Mithras (day of the unconquerable sun, Mithras). This was a Universal Edict. Romans considered anyone who did not worship the sun to be an atheist and a traitor, since Caesar was the sun enthroned in a man. Monday – the Day-of-the-Moon. To the Romans, lunae dies Moon was identified with Artemis (Diana) – Artemis is depicted with the crescent moon beneath her feet as if riding in a boat – in Roman illustrations. Wednesday – Wodin, Odin’s Day The Romans honoured Mercury on this day, calling it Mercurii dies (Mercury’s Day). Thursday – Thor’s Day – the deity of thunder and son of Woden and Freya. 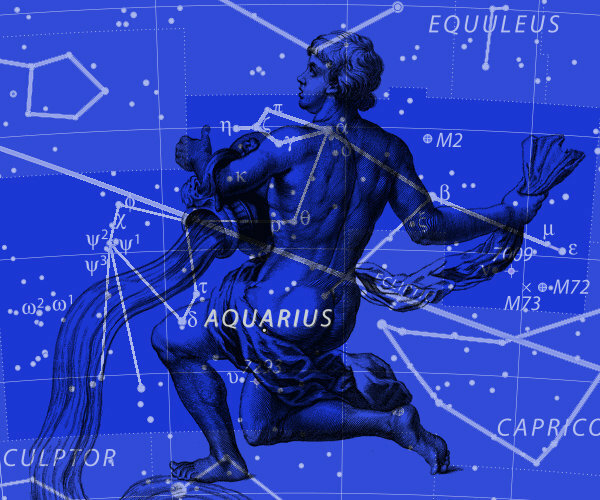 The Romans honoured Jupiter on this day, which was originally IU-PITAR, meaning Jovis-father. “Jove” – Zeus. 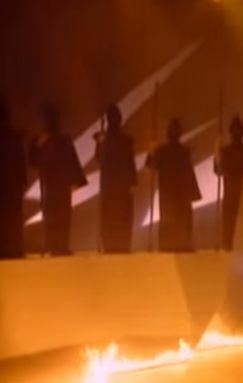 The Altar of Zeus, used at every Olympic game is lit by a torch. The altar is T-shaped – Thor’s emblem was the hammer, secretly interpreted as the letter T – harkening back to Tammuz (Babylonian Duzu), – the son of Nimrod and Semiramis the special DARDANUS (Dardania – Kosovo)!!!!! Friday – Old English Frigedaeg – Frey Day or Frigga Day. Frigga –wife of Woden. The Greeks honoured Aphrodite on this day, and the Romans venerated Venus(Astarte). This day was the Egyptians day of Isis – depicted with the symbol of the fish on her head. The fish symbol pre-dates the Egyptians coming from the Phoenician/Philistine cult of Dagon. Dag is Hebrew for fish and Latin – Pisces. Chosen by the Romans for fertility symbol because fish lays thousands of eggs. The Greek word ichthys(ikhthus) means fish. 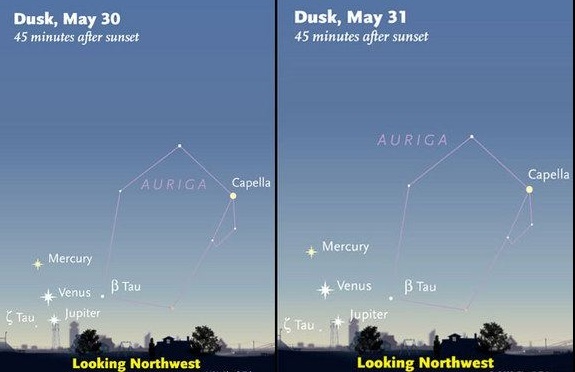 Saturday – the Greco-Roman Day of Saturn. Saturn was the Romans deity of agriculture – Greeks is ‘Cronus’ This day was dedicated to Saturnus – the big party at the end of the Roman year at the Solstice, Saturnalia. This 7th day, the commemoration of Creation, in which we honor the Creator as the Creator. March (1st month) – Mars – deity of war, Nimrod first man of war. April (2nd month) – month of Venus, also called Aprilis, from Etruscan Apru, from the Greek Aphro, – for Aphrodite – Greek fertility deity. Easter Nimrod’s mother. June (4th month) – for JUNO, Roman female deity – wife and sister of Jupiter, identified with the Greeks as Hera. July (5th month) – dedicated to Julius Caesar, the first emperor. He was honoured as a deity, son of the sun. August (6th month) – the word is Latin meaning – venerable, magnificent, awesome. Gaius Octavius took the name “Augustus Caesar” after becoming Emperor, and had his name used for this month. At first, the Romans had only 10 months. Because of many complaints, Julius Caesar appointed Sosigenes, an Alexandrian astrologer to devise the needed corrections and added 2 months. January – from a domestic deity, ‘Janus-Nimrod’ – the ruler of beginnings, the double headed eagle. Caesar was born into a patrician family, the gens Julia, which claimed descent from Iulus, son of the legendary Trojan prince Aeneas, supposedly the son of the goddess Venus. He was a Roman general, statesman, Consul and notable author of Latin prose. He played a critical role in the events that led to the demise of the Roman Republic and the rise of the Roman Empire. 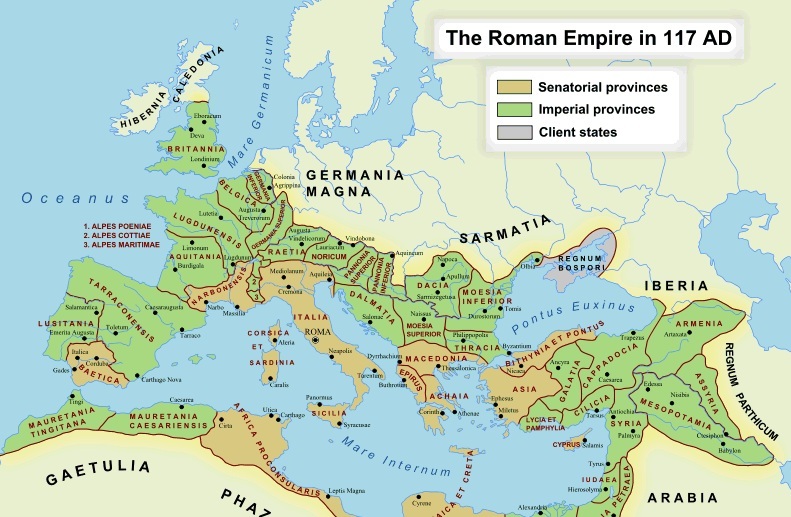 In 60 BC, Caesar, Crassus and Pompey formed a political alliance that was to dominate Roman politics for several years. Their attempts to amass power through populist tactics were opposed by the conservative elite within the Roman Senate, among them Cato the Younger with the frequent support of Cicero. 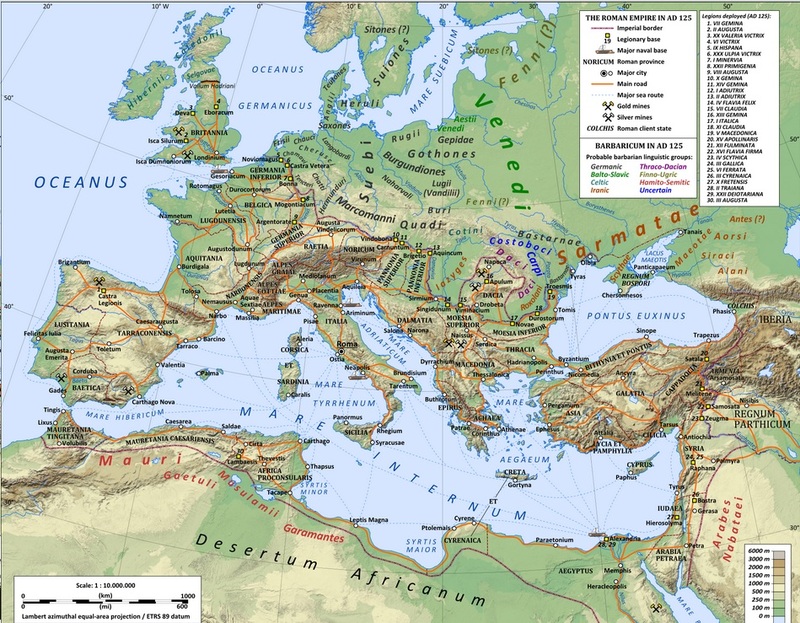 Caesar’s conquest of Gaul, completed by 51 BC, extended Rome’s territory to the English Channel and the Rhine. Caesar became the first Roman general to cross both when he built a bridge across the Rhine and conducted the first invasion of Britain. Why 2012/12/12 12:12 am and 2012 12 12 12:12 pm are so significant for the Hamitic People? 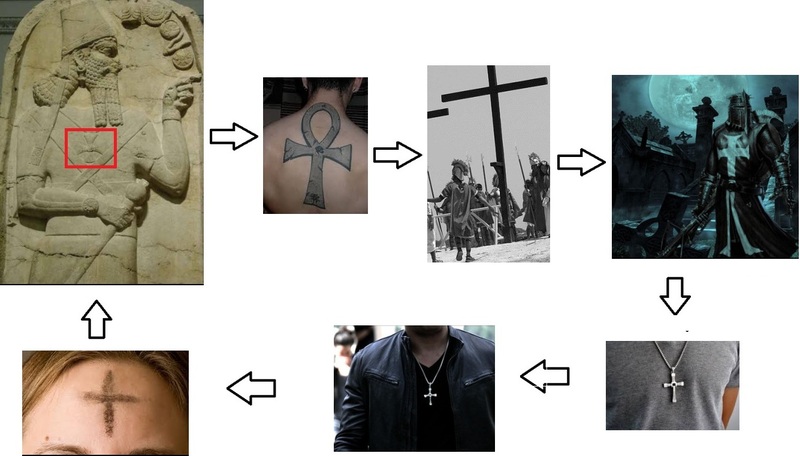 Because it Marks the The Awakening, The Revival of the Hamitic Roman Latinus term for all the Males that Carry the E-M35 and E-V13 Genetic Markers. in Honor of all Roman inhabitants before the fall in 500 AD when the Western Empire was taken over by the Germanic King Odacer, starting the Dark Ages of our own history. 2012 12 12 Marks the day when the Gate of Elohim was opened again. It is our rebirth as Hamitic people is it our Annus mirabilis a Latin phrase meaning “year of wonders” (or “year of miracles”). A day of Great Joy and beginning of a New era of love and Unity among mankind. What is the Symbol of the Latin Roman Hamitic people? The Symbol of the Revived Hamitic Roman Latinus is the two Headed Eagle. Carefully chosen as the beginning of a New era. What the Two heads means? 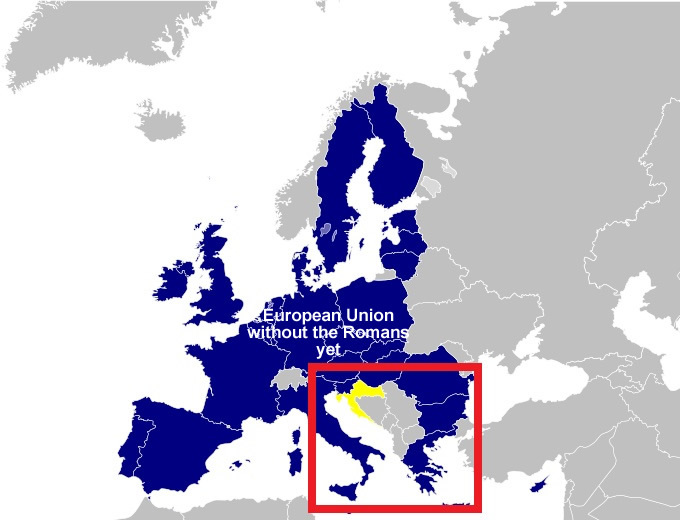 One Head looks Towards Latin Europe (E-M35 gene pool – Kosovo, Albania, Rome, South Italy, Sicily, Greece, Macedonia, Montenegro). 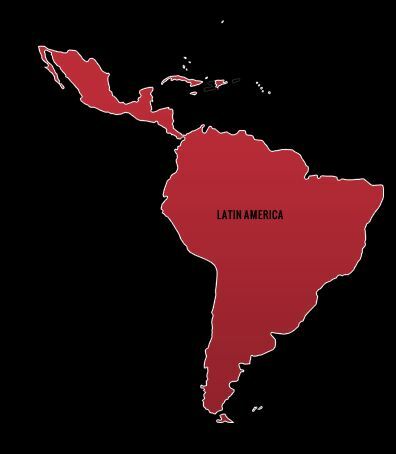 One Head looks Towards Latin America (E-M35 gene pool – from Mexico to Argentina and the Latin and Hispanic living in the USA and Canada). Latium Latinus (the Roman form of the Greek Lateinos), and Lateo, “to lie hid,” all alike come from the Chaldee “Lat,” which has the same meaning. The name “lat,” or the hidden one, had evidently been given, as well as Saturn, to the great Babylonian god Nimrod. When was the Revival of the the Two Headed Eagle? A little one, which is coming up among them; and three of the first ones will be uprooted!! !